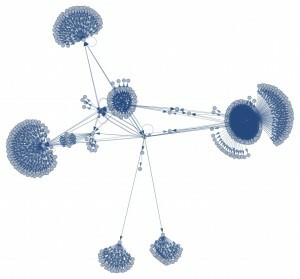 The network of links stemming from ianmilligan.ca (activehistory.ca alone was too big!). This gives you a visual sense of the power behind hyperlinked information! We will need to make dramatic changes to history undergraduate curriculums by aggressively implementing digital literacy programmes. This will benefit both our students and the historical profession. Why? Let’s imagine how a future historian will tackle the question of what everyday life was in September 2011 – today. She will have a tremendous array of sources at her fingertips: the standard newspaper and media reports and oral interviews that we use today, but also a ton of added sources that would help give a sense of the flavour of daily life. Two hundred million tweets are sent every day. Hundreds of thousands of blog posts. Incredible arrays of commentary, YouTube videos, online comments, viewership and readership numbers will all hopefully be available to this historian. But how will she read it all? Realistically, nobody is ever going to be able to get through all the tweets for even just one day: let alone categorize, analyze, and meaningfully interact with it. She’ll need to use digital tools. We are at a crossroads. This sort of history won’t be the be all and end all of future historical research, but I believe that somebody is going to do this sort of social history. Let’s make sure our future students are ready for it! 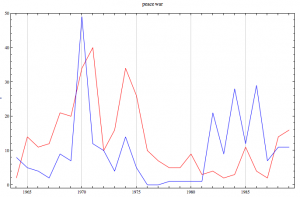 Using Mathematica, I have been able to track the rise and fall of the terms "war" (red) and "peace" (blue) across a comprehensive Top-40 Lyrics Database. We need to begin thinking about how we are going to train historians of the future, today. Somebody is going to do this work. They are probably sitting in high school or elementary school classrooms today. When they show up at the university, let’s make sure that we’re ready to train them to write the history of today.. tomorrow. This is not simply for historians who fashion themselves as social scientists, as opposed to those who see themselves as pure humanists. It’s about deploying a tool which can provide information through which we can drape our stories, our interviews, our human anecdotes, etc. Historians need to begin thinking about digital literacy and writing programs that will help access these sources. What’s going on right now? Tons. I have previously discussed one of the biggest current projects, the Culturomics project and their accessible Google n-gram viewer. You can see the rise and fall of a word or phrase (an ngram) and see how much it has been used across several centuries. It’s an incredible project, albeit not without some caution needed in how it is approached. There are also several digital history projects ongoing, some of which has garnered considerable attention (such as the Criminal Intent project in the New York Times). This is just a hint of what’s to come. We need to be able to populate these future projects with even more historians. Which means thinking about how to train them today. Training these people by graduate school is simply too late, however. We need to begin training undergraduates in their first year. Indeed, as a recent study carried out at the University of Rochester indicates, students won’t adopt new technologies by the time they get to graduate work – the risks are too high. Let’s get them as undergrads. What could a digital literacy programme look like for the next generation of historians, so that they’re ready to begin thinking and tackling these issues? We’ll need a firm grasp of the historiographic context of this shift – i.e. the old school quantitative historians, who crunched the census of Hamilton for example, or poured considerable time and effort into understanding demographic shift. Basic digital tools: What is cloud computing? How can we secure and backup our data? How can we digitally organize conventional sources? I’ve discussed this before in my post on Zotero. Grasping the SHEER SCOPE of large digital depositories. It’s one thing to say that Google Books has fifteen million books. It’s another to really grasp this. And to further realize what a drop in the bucket that is compared to other repositories of automated data being collected every day. Basic programming? The ‘Programming Historian‘ is a great start. What most of us will have to do won’t be so complicated and we need to be able to do it ourselves. While well-funded projects may be able to raise the funds to recruit teams of programmers to join them, or others may form collaborative and interdisciplinary work-teams, many historians will not be able to do so. They should be self-sufficient in this regard, at least for more simple and routine data mining exercises. Our students should be able to come out of undergraduate history programs and be truly equipped for our knowledge economy and for the future demands of the profession. This will help teaching, research, and labour market outcomes. Information is increasingly being generated by the internet, written on the internet, and being consumed by internet users. People need to be able to create it, interact with it, in a fluent, comfortable manner. What do you think? Should historians make this shift? Or are there disadvantages that I’m overlooking in my enthusiasm for this field of research? I’d love to hear from you all, especially as I begin my next project (a digital history of postwar English-Canadian youth). As usual, I find the perspective on digital humanities interesting. There are a few things that strike me about this post though. The first is that much of the way you describe things are only applicable for those studying the last 120 years. For earlier periods the sources have not been sufficiently digitised to allow many of these projects (though running newspapers through Mathematica is possible for the late 18th century). We still need to figure out how either how to digitally transcribe a lot more early sources for cheap or design computer code to do it for us. If the numerous existing sources were accessible to a Mathematica or even key-word search, we could find fascinating things about the 17th century (for which the lack of censuses and sociology/economics departments have left us searching to answer much bigger questions than for the 20th). 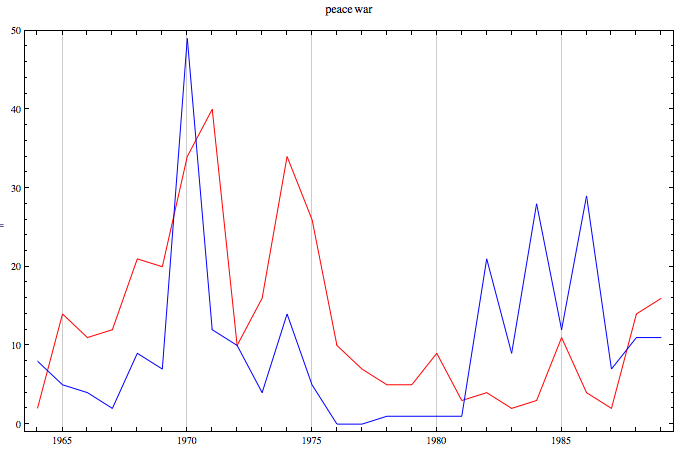 The other thing that strikes me is that your Mathematica graph creates an interesting question to ask, but one that still needs to be answered with conventional methodology (that being why peace disappeared from lyrics around 1973 as war increased dramatically). These become a tool that creates interesting questions, much like regional inequalities or contrasting levels of criminal prosecutions, and can disprove wrong answers. The major difficulty is to develop historians with the computer skills to determine the questions and the nuanced understanding of sources to find answers. Thanks for your comments, David. I believe that the number of historical sources is going to keep growing, for both more modern as well as further back time periods. Optical Character Recognition (OCR) software is also becoming increasingly cheap and powerful (you can run it on your own photographs, for example), although it still has a ways to go. But computers can guess at murky and opaque words better than we can at times, just like they can do crosswords better than we can. And ultimately, I completely agree that these are tools that raise questions – which are critically important – that still need to be answered, sometimes through traditional historical inquiry. This is why we need to get more historians involved on project teams, to bring our specific disciplinary skills to bear on these issues. I strongly believe digital history can be complimentary to traditional lines of inquiry, rather than a zero-sum game. Great post, Ian. Obviously, I agree with your call for the integration of digital literacy skills in undergraduate history education. I’ve always thought that undergraduate history education affords numerous opportunities for students to develop what some might call “transferable skills”. Writing, public speaking, critical thinking, and project management are some of the more obvious skills, but there are many opportunities to teach digital literacy. To pick up on another point you raise, I also agree that we need a firm grasp of the historiographical context of this shift. That is to say, we may need an article or even a special issue of a journal focused on how technologies have influenced historiographical methodologies (“From punch-cards to the n-gram viewer”). Not having looked into this, I wonder if such a publication already exists. If anyone knows, please post a reply. Thanks, Sean. This raises an additional point: we need to move past the myth of the ‘digital native.’ I certainly agree that we can and should increase the use of technology in the classroom and in our own professional practices, but proceeding from an assumption that our undergraduate students are technological wiz-kids is dangerous. Google and Facebook are so user-friendly that they obscure the need to dig a bit deeper for many – from Boolean operators to sophisticated Google searches to understanding the very basic architecture of the web, etc. Many of my own students didn’t know what Twitter was, let alone the basics of e-resources. Which isn’t their fault – many of us either falsely assume they know this stuff already, or don’t teach them! Which, of course, is where we can come in and help develop their comfort level with basic technology into a sophisticated ability to deploy these tools.